Hamilton, Bermuda (AP) – It’s on again, mates. The 35th America’s Cup match will be another showdown between Oracle Team USA and Emirates Team New Zealand, a rematch of the epic 2013 regatta that was decided by one of the greatest comebacks — and collapses — in sports. Emirates Team New Zealand earned its spot in the finals of sailing’s marquee regatta when it sped away from Sweden’s Artemis Racing on Bermuda’s Great Sound on Monday to clinch the challenger finals at 5-2. It’s almost as if it were preordained that the scrappy Kiwis, now led by unflappable 26-year-old helmsman Peter Burling, would once again face the powerhouse U.S. squad owned by Silicon Valley maverick Larry Ellison, skippered by nails-tough Australian Jimmy Spithill and featuring few Americans on the race crew. “We definitely feel like we’re in great shape to take on Oracle now,” Burling said. The match starts Saturday with Races 1 and 2. Oracle Team USA needs to win seven races to keep the oldest trophy in international sports. 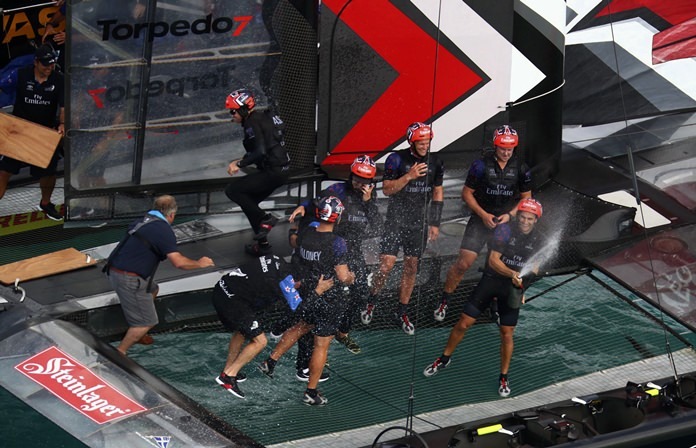 Because Oracle won a bonus point by winning the qualifiers, Team New Zealand must win eight races. In 2013, Oracle Team USA started at minus-2 after being penalized in the biggest cheating scandal in America’s Cup history. It still won. Emirates Team New Zealand reached match point at 8-1 on San Francisco Bay. It had a big lead in what could have been the clinching race, but the breeze died and the time limit expired. Later that day, Oracle Team USA began an eight-race winning streak that allowed it to retain the Auld Mug. On Monday in the challenger finals, a first attempt at Race 7 was abandoned at the 25-minute time limit with the boats crawling in barely a knot of wind. In freshening breeze a few hours later, the Kiwis dominated. They finally won a start against Artemis skipper Nathan Outteridge. Their 50-foot catamaran rose up on hydrofoils and showed its incredible speed in a 56-second, wire-to-wire victory. There were subdued celebrations aboard the Kiwi cat until a magnum of champagne arrived . Grinder-trimmer Blair Tuke, who teamed with Burling to win Olympic gold and silver medals, popped the cork and sprayed his mates. Their focus has to shift immediately to trying to atone for the mind-blowing loss in 2013. The Kiwis capsized last Tuesday, throwing three sailors into the water and extensively damaging their catamaran. They came back two days later and clinched their semifinal against Britain. Oracle Team USA beat Team New Zealand twice in the round-robins. Artemis, led by Olympic gold medalists Outteridge of Australia and Iain Percy of Britain, looked good in practice races earlier this spring but didn’t find its stride until late in the trials. It rebounded from a 3-1 deficit to win four straight races against SoftBankTeam Japan to win its challenger semifinal, but too many unforced errors cost it against the Kiwis. Among them was Outteridge falling overboard in Race 3 on Saturday. It’s a bittersweet departure for Artemis. It had to regroup after the tragic death of Andrew “Bart” Simpson — Percy’s partner in winning Olympic gold and silver medals — when its 72-foot catamaran broke apart on San Francisco Bay in May 2013. Team New Zealand first won the America’s Cup in 1995, with Russell Coutts skippering a 5-0 victory against Dennis Conner off San Diego. It defended in 2000, lost it in 2003 and reached the match again in 2007 before losing.